Adam Russell was involved in a collision on a rural road on his motorcycle. He negotiated a wide left hand bend and was pulling his motorcycle upright when a Hilux 4x4 and large 30ft trailer pulled out from a field to his left. A collision occurred and Adam was seriously injured but the driver’s insurers blamed Adam maintaining he had been riding at excessive speed and had failed to respond and react appropriately to the vehicle emerging from a field. Agricultural traffic could be expected on rural roads and Adam should have been able to stop in time to avoid a collision. The driver was deemed to be 100% to blame as there was no evidence of speed and sight-lines were reduced for both driver and motorcyclist. However, the Court held the driver had failed to take all reasonable precautions when emerging from the field close to a bend and there was no evidence the motorcyclist had done anything wrong. Third Party Driver 100% to blame. The following video follows the path taken by the motorcyclist. 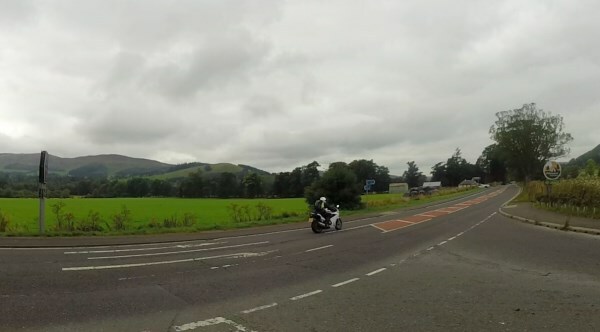 Note the entrance into Glentress on the right and the vehicle sitting there which would have been the key focus for the motorcyclist taking the left hand bend. The 4x4 exited from the field on the left where the white Audi is sitting in this video.